Liberty girls basketball coach Chad Kapanui gave his players one simple message before Wednesday afternoon’s game against Canyon Springs. “We can’t take them lightly,” he told his girls. 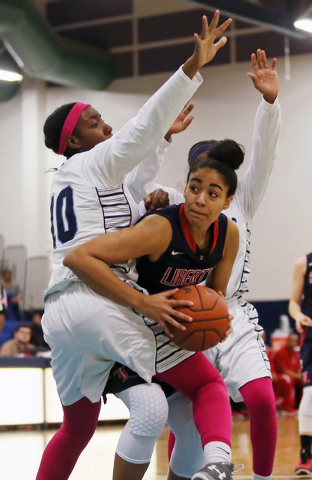 After escaping with a two-point margin in the team’s previous matchup, Liberty left no room for doubt the second time around. Kealy Brown scored 12 of her game-high 20 points in the first half to lead the Patriots to a 58-39 win over the host Pioneers. The win, at the minimum, guaranteed Liberty a first-place tie in the Northeast League with two games remaining. 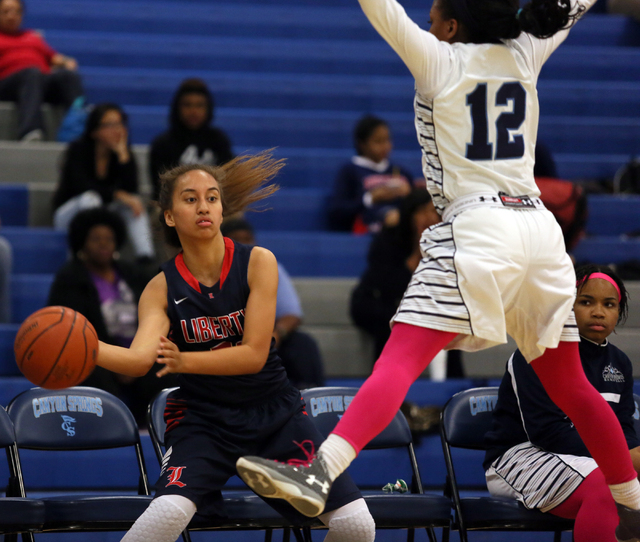 Liberty, which rallied to beat Canyon Springs 47-45 on Jan. 9, made sure not to come out flat this meeting. The Patriots were aggressive from the opening tip, particularly on the defensive end, parlaying 12 first-half turnovers into a 35-23 halftime lead. 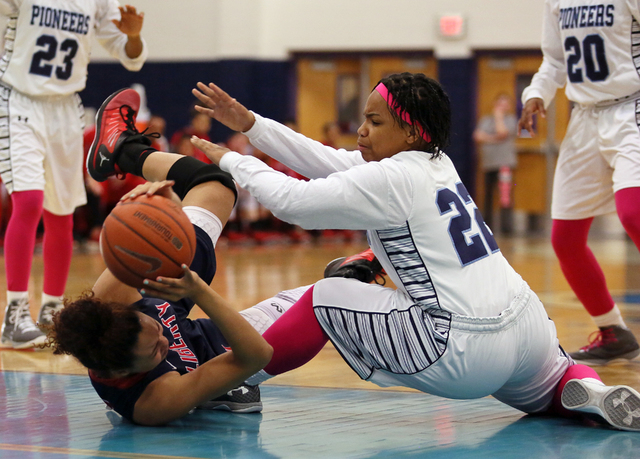 Canyon Springs finished with 23 turnovers, and was held to just 12 of 54 shooting (22.2 percent) from the field. 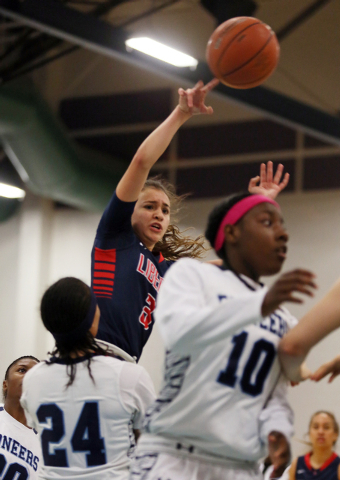 Liberty’s Paris Strawther totaled 14 points, 12 rebounds and three assists, and Kaily Kaimikaua added 11 points for the Patriots (20-3, 6-0). 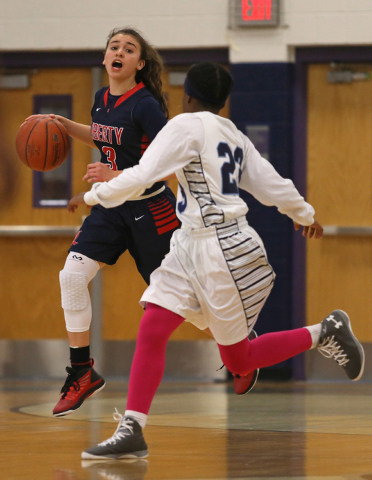 Nancy Caballero also had 10 points and seven rebounds for the Patriots. 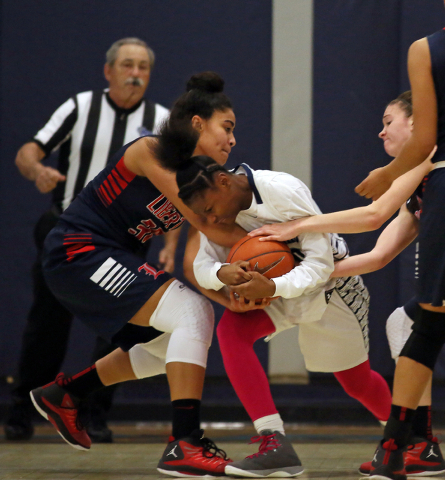 Caballero made a buzzer-beating layup just before halftime, when a double-teamed Strawther found her open under the hoop. Alexia Thrower had 17 points, seven rebounds and four steals to lead Canyon Springs (12-7, 3-2). 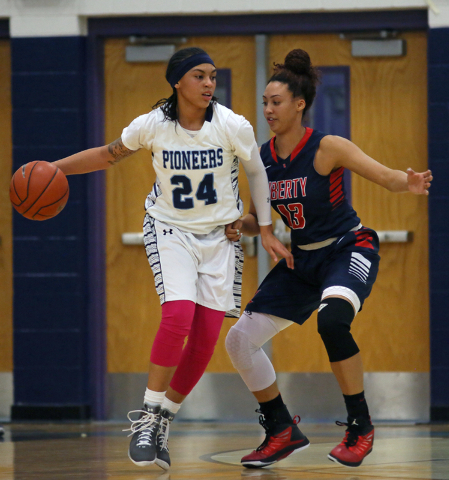 Dre’una Edwards notched 12 points and six rebounds, and teammate Daijhan Cooks added eight points, four rebounds and four assists for the Pioneers.